I really began leveraging social media for my business in 2006. At the time I was in a sales role and networking came naturally to me. Though I had a LinkedIn account, like many people at the time, I wasn’t really using it as a business development tool. I started to use LinkedIn as more than a social network, and began to leverage it as a tool to build, manage, and grow relationships. As my network grew and I began engaging with people on LinkedIn more frequently, people began to notice. Colleagues would reach out with questions, and what began as a cup of coffee to help someone set up a profile, quickly morphed into MKELive, a networking group centered around meeting people and using LinkedIn to stay in touch. As the facilitator, I helped shift the perception of LinkedIn from a job seeking tool, to a valuable business development and relationship management tool. That fundamental shift in the way we view LinkedIn is still a piece of what we offer at Strategy House. Since then I’ve focused on training B2B sales teams how to use LinkedIn. 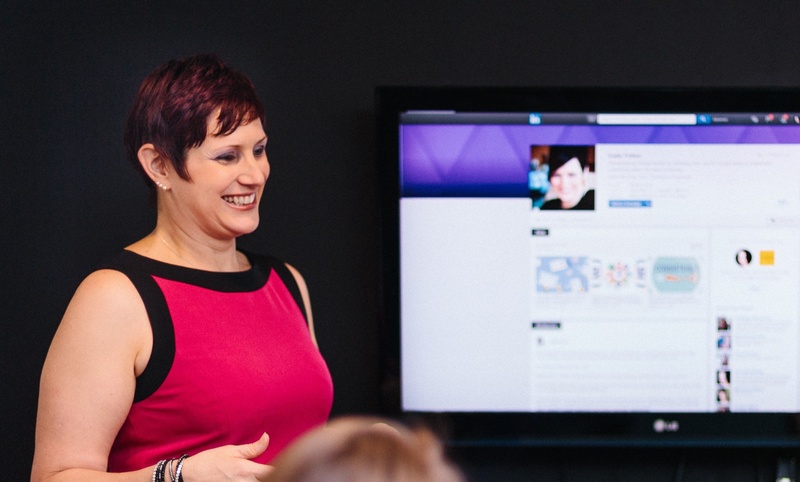 Now, with countless training sessions and speaking events under my belt I teach them how to leverage LinkedIn to create brand awareness, generate leads and establish their organization as industry experts with clear cut plans and processes. As a speaker, my goal is to change people’s perception of the way they use LinkedIn. Many tend to see the platform as a job search tool or merely another social network they have to keep up with. Instead, I help them view LinkedIn as a living, breathing rolodex that allows people (especially those in a sales role) to tap into the network they’ve worked hard to grow over the years and leverage connections to grow their business. Focus on customers and prospects vs. recruiting or hiring managers. I’ll help you speak directly to the customers you want to work with. Train your team on how to leverage LinkedIn as a business development tool whether your goal is customer research or reaching out to new prospects. Teach you what to do on a daily basis on Linkedin to stay top of mind with consistent customer centric content, so that people in your network associate you with your niche. Ready to start seeing results with LinkedIn? Let’s chat about how I can help. Katie is definitely the "go-to" for all things Linkedin. When she spoke to our office, she gave clear and concise information on why using Linkedin is so important for our business. Now our office and agents understand the importance of utilizing this tool to further our individual businesses. We have been using your recommendations regarding LinkedIn and it is working. We decided to consistently post, share and interact, and not only have we been getting more LinkedIn leads, but we closed our first long-term engagement from that new group of LinkedIn leads. I started working with Katie and her team because I was having trouble utilizing LinkedIn. She helped me create a profile that communicated my skills and expertise in a way I could not have done, and walked me through all the best ways to use LinkedIn to help my grow my business. Her guidance helped me find new clients and collaborators I could not have found with my prior LinkedIn profile and usage. I highly recommend Katie for anyone looking to make their LinkedIn profile shine! The LinkedIn for business development workshop was great, very informative! I saw everyone taking notes, the group really seemed happy with the information you provided. I can’t wait to put it to good use myself! Thank you again for a great, informative presentation. 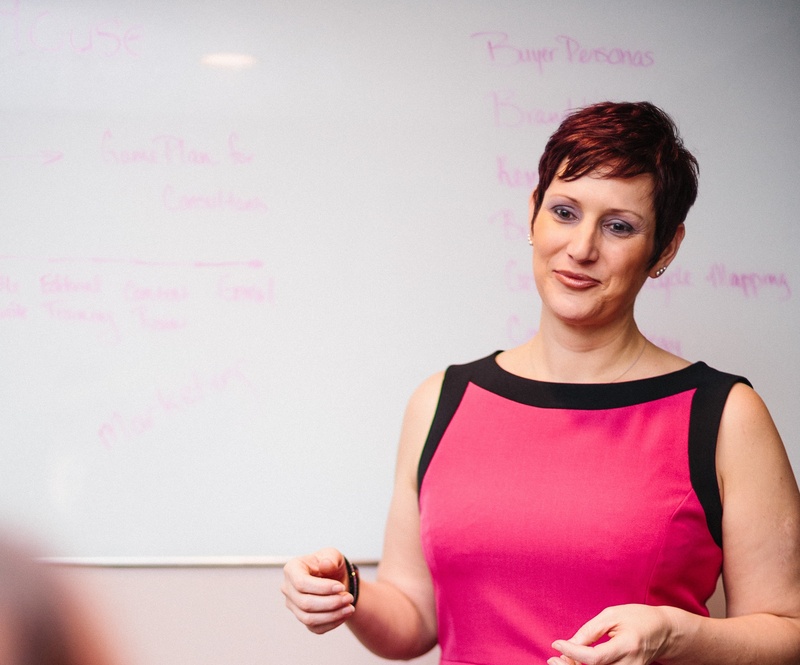 Katie is extremely knowledgeable with LinkedIn and her expertise will keep your audience engaged and excited to immediately begin applying the tips, tricks, and tactics they will learn! We needed to standardize what LinkedIn looked like for each person on our sales team. Katie did a great job helping us identify what we wanted say about our company and our sales team. Her approach was organized and comprehensive. She did a great job showing our sales team the benefits of social media for their business and her weekly email tips/practice are helpful in reinforcing what was learned in training.